Treat yourself to the luxury of a spa experience in the comfort of your own home with the SolReya Spa Wrap. 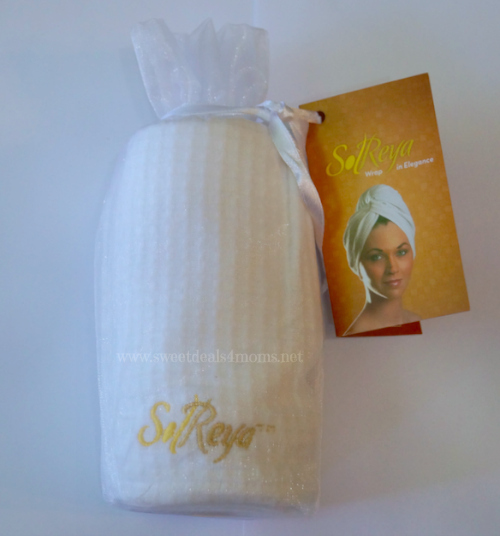 If you wrap your hair with a bulky towel after you wash your hair, then you will love the SolReya Hair Wrap. This luxurious wrap is made of 100% richly textured cotton. The design provides full head and hair coverage for most hair lengths and fits most head shapes and sizes. I received a wrap so that I could try it out and I love it. It’s super soft, absorbent and it’s light weight too. It’s also machine washable. While it’s made of 100% cotton, it could shrink a little, but I haven’t noticed much shrinkage on mine. It’s still as soft and comfy as the first time I used it. It features button fasteners to keep it in place. It’s seriously comfortable. So much so, that I end up leaving it on for a bit longer than I would a towel. My little girl thinks it’s really neat and asks to use it when I wash her hair. With enough twists, it fits on her head too. 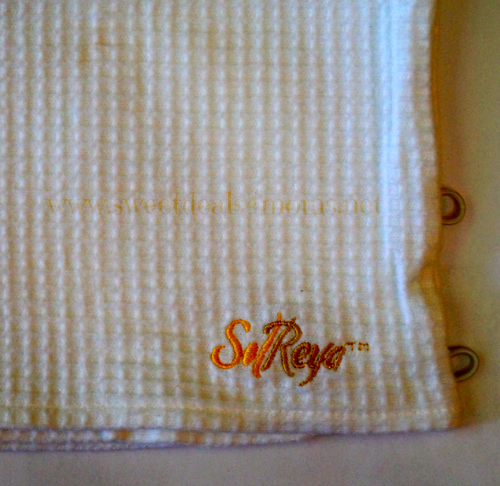 Buy it: The SolReya Wrap is made to be used by the finest spas and hotels in the world, but you can get one of your own for $25. You can call in your order at 208-890-3611 or go here and fill out the contact form to have someone contact you. Be sure to mention that you saw the product on Sweet Deals 4 Moms blog. Win it: One of you will win a luxurious SolReya hair wrap of your own. Please enter through the Rafflecopter below. It may take 30 seconds or more to enter. Disclosure: I received a free product as part of this review. All opinions stated are my own. I would definitely use it on my hair. I would use it. I would prefer it to using a full towel. I would use it all of the time. My towel keeps falling off my head and it would be nice to have a towel that wouldn’t fall off. I don’t know if it was the same brand, but 20 years ago in college, my roomate had one like this and she loved how well it worked. For being light weight, it really absorbed water! I would love to use this product. I have very long hair and its quite annoying to wrap it in a regular bath towel after I shower. This product looks great & I would use it often. I would like to try this product. I always use a heavy towel after washing and I think this would be more convenient to use. My daughter has long hair and would use this also. I always wrap my hair so I would for sure use it more! I would love to have a SolReya Spa Wrap. Boy does it ever look more convenient than wrapping your hair in a towel. I have long hair and the towel always falls out. This wrap would be the answer for me when I get out of the shower and I would use it ever day looking forward to wrapping my hair in this soft cotton wrap. I love how easy this is to use and would use it on a daily basis. Would love to win the wrap for my best friend’s birthday and the head wrap for me! I would use this all the time. I think it will be better than using a big towel. I would use it all the time. The towel around my head gets heavy but I like to have my hair out of the way while I get ready. My wife would use it often. It would be more convenient than a towel.